A walk round Nottingham, Part II. ON leaving the Free Library we turn to the left, and yet another turn to the left brings us into Shakespeare Street. 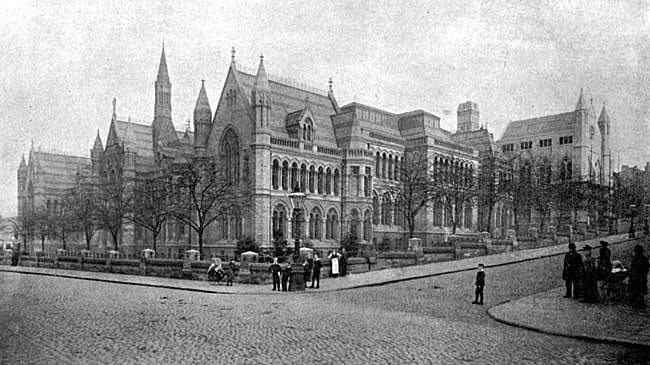 The large stone building on the left-hand side, of which the Free Library obviously forms a wing, is the University College. This Institution is Corporation property, managed by the Corporation. An endowment of £10,000 was given by the late Mr. Henry Heymann of West Ridgford, and the magnificent pile of buildings was opened in 1881, by H.R.H. the late Duke of Albany. Standing back from the street, in a tree-planted enclosure, the College presents a picturesque assemblage of gables and pinnacles. The extensive frontage is for the most part two storeys in height, the roof-line being broken by a gable in the centre and one at each end. The Gothic character of the design is seen in the pointed windows and arches, giving lightness and grace to the whole. The statues occupying the brackets represent Shakespeare, Milton, Bacon, Newton, Watt, and Cuvier; the group, in high relief, stretching across the main gable, represents the progress of knowledge. The principal entrance is in the centre, reading to the hall and corridors; on the left of the hall is the Porter's Lodge, where inquiries may be made. The corridor to the right leads to the Secretary's Office and Professor Carr's Natural History Department; that on the left to the Principal's Rooms and Literature Sections. Further to the rear are Lecture Theatres for the different departments, and well-appointed Laboratories for Chemistry, Physics, etc. The upper storey is reached by a staircase from the hall, and here will be found extensive class-room accommodation. The public entrance to the Large Theatre is on this floor; in it popular lectures are given by the College Staff and distinguished men from a distance. For hours for visiting the College, visitors should apply at the Porter's Lodge. The stucco-fronted building opposite the College is Shakespeare Street Chapel (UNITED METHODIST FREE CHURCH), and the handsome red-brick edifice, with stone facings, is the Poor Law Guardians' Office. There is excellent accommodation in the interior for the Clerk (Mr. Muncaster Howard), Relieving Officers, Medical Officers, and Dispensary. On the first floor is a spacious chamber where the Board Meetings are held. The WORK­HOUSE at Bagthorpe, two miles from the centre of the town, was opened in 1902. It is not a "building," but a collection of buildings, forming a small village in itself. This modern and convenient "colony," was designed by Mr. Arthur Marshall, A.R.I.B.A., and is rightly considered one of the best institutions of its kind in England. The large number of separate blocks allows of careful classification of the inmates; the Infirmary for the sick is composed of two-storey pavilions, and stands quite apart from the quarters for the able-bodied poor. Turning along Bilbie Street, on the opposite side of the road, we come to the NATURAL HISTORY MUSEUM, forming the right wing of the College. Open, free, daily (except Fridays). Curator, Professor Carr. The lower room is devoted to Vertebrates (i.e. fishes and all animals higher in the scale). There are numerous stuffed animals, including a very fine gorilla, arranged in glazed show cases, with background and rustic scenery imitating as far as possible their natural surroundings. The upper room is devoted to the second great class of animals, namely, Invertebrates, of which it contains a large number of specimens, as well as minerals and geological objects. The Technical Buildings adjoin the Natural History Museum. They are of similar design to the main College block, but were erected later, viz., in 1892. Here are taught such arts as dyeing and bleaching, useful in the staple industries of the City, lace and hosiery, as well as mining, engineering, plumbing, fitting, carpentry, etc. St. Andrew's Presbyterian Church. Masonic Hall. Victoria Hall. The JEWS' SYNAGOGUE is in Chaucer Street, to the right of St. Andrew's. A few yards to the left will bring us to a "neat, but not gaudy," building of brick. This is the MASONIC HALL, wherein the local Masonic Lodges, both for town and county, meet. The large rooms are let for public meetings, receptions, etc. The Masonic Club has quarters here. The largest Public Hall in the town is in this neighbourhood, namely, the VICTORIA HALL; to find it, turn up the Lower Talbot Street a few yards to the left of the Masonic Hall. Erected in 1876, it has been used for a variety of purposes, e.g. revival missions, a female mind. Accordingly the High School for Girls was established in 1875, and occupies the large red-brick building seen from the further end of our walk. The stone spire to the right of the school belongs to Addison Street Congregational Church, opened in 1884. On the right-hand side of the walk we pass the stone statue of Fergus O'Connor, formerly M.P. for Nottingham; a "Chinese Temple" containing a bell captured in one of our Chinese Wars; and some cannon taken at Sebastopol. Passing under Addison Street, we speedily find ourselves in the wide and handsome thoroughfare of Mansfield Road. This beautiful umbrageous avenue was once known as "Gallows Hill," from the gruesome apparatus which once adorned its summit. As for the modern attractions of the neighbourhood, it will be sufficient for the present to name them, leaving their detailed exploration to a future occasiou. Almost opposite the Arboretum Approach is the pleasant, shady walk of Elm Avenue, leading to Corporation Oaks and St. Anne's Hill. From the latter point we obtain splendid views of the City lying at our feet. "Blue-Bell Hill," on the opposite side of the Beck Valley, is already covered by bricks and mortar. The wise policy of the Corporation in providing these stately avenues of "Elms" and "Oaks" in the midst of the crowded city is self-evident; the only regret is that things are not "more so," as we see meadows and gardens rapidly despoiled by the builder in utter neglect of the things which go to make life—especially child-life—healthy and bright. The stone building with embattled tower above Elm Avenue is a Presbyterian Church, erected 1900, and on the actual crest of the hill is the handsome Cruciform Church, with lofty spire, dedicated to St. Andrew, opened in 1871. Facing St. Andrew's are the entrance gates of the Church Cemetery. As the name implies, this ground is consecrated for the burial of Church people. It is thirteen acres in extent, and was laid out in 1853. This remarkable Cemetery is worth a visit on account of the many caverns occurring in the soft sandstone rock, which here, as in many parts of Nottingham, comes to the surface. In places the rock has been cut away in making the paths, and in others forms an arched covering overhead; but the caves for the most part are closed to visitors, owing to the danger of falling roof. At the lower part of the grounds the rock breaks off precipitously, enclosing a weird, desolate, semi­circular area—a fitting "place of a skull." Turning our steps homewards, we may either take a car, which will land us in the Market Place in ten minutes, or may notice some of the objects of interest in the course of a gentle saunter down-hill. Opposite Woodborough Road, where the branch tram­way to Mapperley leaves the Mansfield Road, is a gabled Elizabethan building of red brick, standing back from the street. This is the BLUE-COAT SCHOOL, founded in 1706; but the present structure, the work of the late Mr. T. C. Hine, was erected in 1853. Like the scholars of Christ's Hospital, the boys, of whom there are seventy, wear a quaint, old-fashioned uniform. The girls, to the number of thirty, go about in white caps and aprons and blue gowns. In Blue-Coat Street, on our right, is the SWEDENBORGIAN CHURCH. On the opposite side of the road, with a fine frontage looking up the Mansfield Road, is the WESLEYAN CHURCH. A little nearer the town is the NOTTINGHAM TABERNACLE (Baptist). Owing to incurable structural defects, this building was permanently closed in May, 1906. Almost next door to the last-mentioned is the entrance to the excellent premises of the Y.M.C.A. There are numerous religious and social agencies at work for improvement of members, and public lectures are given in the winter months. Round the corner, in Shakespeare Street, is the CENTRAL HALL, which is occasionally used for public meetings, and in the same building is the CHRISTADELPHIAN MEETING ROOM. We now pass, on our left, the VICTORIA STATION AND HOTEL (for description see page 33), and on our right the red-brick BAPTIST CHURCH, with Norman portico. Here for many years the Rev. Dr. Cox was Minister, who edited the Expositor, and was known by his writings far beyond the scene of his actual minis­trations. We next come to a large drab-painted building of classical design, occupying the corner site between Milton Street and Trinity Square. This is the MECHANICS' INSTITUTION, which, though originally built in 1844, was restored in 1867-8, owing to its destruction by fire—and to this circumstance may perhaps be attributed its somewhat ineffective appearance. A more modern portion, the present READING ROOM, was erected in 1884. it forms a handsome annexe, built of freestone, well lit by an ample bow-window overlooking the street. The MECHANICS' LARGE HALL, which contains a good organ, is in great request for Concerts, Lectures, Bazaars, etc., and for objects of less importance a smaller hall is available. There are excellent Lending and Reference Libraries, and an extensive collection of local books and prints. Some of the best lecturers in the country occupy the platform during the season. Holy Trinity Church and Square. 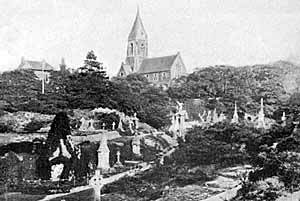 The church was erected in 1841, and is seen to consist of nave and chancel, with a lofty spire at the west end. The seating accommodation is ample, as the area is not only considerable, but there are spacious galleries as well. There is an oak reredos in memory of a former Vicar, Rev. Prebendary Macdonald. Occupying a portion of Burton Street on the right-hand side of the Square are the TRINITY NATIONAL SCHOOLS, among the largest and most important in the City. On the left side of the Square may be seen an inconspicuous building, with upper storey of white "rough-cast," along which runs a sign-board with the legend, "SOCIAL GUILD INSTITUTION." This is the creation of its energetic Honorary Secretary, Miss Henrietta Carey, who is still the moving spirit of its operations. It aims at improved housing, at making "home" healthy, beautiful, and cleanly, at the teaching of useful arts, the provision of country holidays and homes, and, speaking generally, social advancement. A Bit of Old Nottingham. We may now retrace our steps to the Market Place, by the narrow old-fashioned CLUMBER STREET, at the end of which we find LONG Row on one side of us and another busy, narrow street, PELHAM STREET, on the other. We are now in the heart of OLD NOTTINGHAM. On July 16th, 1824, there was great excitement in this particular locality—when Lord Byron's body was carried through the town on its way to its last resting-place at Hucknall Torkard (see p.118). It was followed by great crowds of people, who followed the cortege to the Blackamoor's Head, where it was deposited in a room opening on the yard, to which the public were admitted. Passing along HIGH STREET, we come to BRIDLESMITH GATE, where old houses with projecting upper storeys may still be seen. Here used to be made not only bridles, but wares of all sorts were displayed in what used to be one of the best streets of the town. In the open space between High Street and Bridlesmith Gate the old HEN CROSS used to stand. The solid red­brick building overlooking its site is the COUNTY CLUB, established 1864—the most select of them all. Turning to the right along Cheapside, we notice that the opposite side of the street is still called the POULTRY, in remembrance of the days when hens were sold there (and indeed still are sold there according to the latest market arrangement). Here was situated the ancient "Cucking Stool," done away with in 1731. A noteworthy building in the Poultry is the quaint old inn, THE FLYING HORSE, which is said to date from Queen Elizabeth's time. Continuing along Cheapside, we pass KIRKE WHITE'S HOUSE, and emerge in front of the Exchange. To our left runs SOUTH PARADE, forming the lower side of the Market Place, parallel with Long Row. We can try and imagine the row of seven stately elms which used to flourish here, and the swine which converted South Parade into a dirty and noisome swamp. To-day things are altered, and we may now walk undeterred by swamps and swine as far as QUEEN VICTORIA'S STATUE and inspect it more closely. Near this spot used to stand the MALT CROSS, which is described as consisting of a base four feet high, on which stood six columns sup­porting a tiled roof, the whole surmounted by six sun-dials and a vane. Within stood those who sold china and earthenware. Although the Cross has gone, the custom of 150 years ago still survives (see "Pot Market," p. 41). From the Cross all proclamations or declarations of war or peace were read, "in face of the full market." We learn, also, that the "unemployed" problem was not unknown at that distant date, for about this spot labourers seeking work were wont to collect. Our round is now completed, and Market Street (formerly "Sheep Lane") lies before us.